Pros & Cons of Outsourced Managed IT Services | Consolidated Tech : Consolidated Technologies, Inc.
Every business exists to fulfill a select market niche yet few companies have the in-house computing skills to stay ahead of today’s technical demands. For a growing number of businesses, outsourced IT is the natural solution. What Are Outsourced IT Services? Outsourced IT services are when you hire an outside company to handle your IT needs. A third-party managed service provider (MSP) can cover everything from the security of networks and the implementation of operating systems to the installation of software and the backup of files. Note that outsourced IT services are not just break/fix services. A break/fix technician comes to you when something is broken, charging an hourly fee to diagnose and fix the problem. A break/fix service might seem less expensive since you only pay when you have a problem, but it’s likely to be more costly in the long run. They have little to no incentive to work quickly or make a stable fix since they get paid more if it takes them a long time or multiple trips to repair something. Unlike break/fix services, a managed IT service provider builds a partnership with your company, constantly monitoring your network for a monthly fee. MSPs are there to keep your network running smoothly, not just to fix problems, so they have more incentive to find a fast, reliable solution if something does go wrong. It’s better for you and the service provider if they neutralize threats and fix issues as they happen. Solving a problem the first time means less work for them and encourages you to continue your membership. 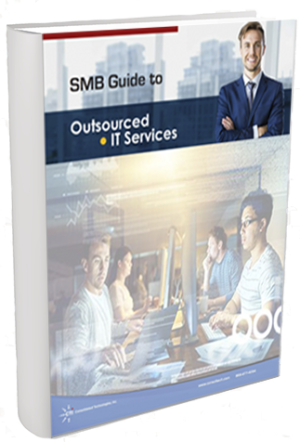 While companies of all sizes can benefit from outsourcing their IT, small to mid-sized businesses (SMBs) might benefit the most since the time and money required to build an in-house IT department is probably better spent growing the business. What IT Solutions Can You Outsource? Until just recently, SMBs needed to build computer arsenals in proportion to their growth as companies. As business spread and your brand became larger, you would need to have large in-house departments full of expensive, complicated, high-tech hardware. Today, you can outsource infrastructural tasks to an MSP staffed with the most skilled computing experts. The MSP handles all the complicated hardware on their end while your staff simply sign on with laptops and smartphones. Some of the most troubling aspects of computing for SMBs have involved software, which can be confusing to upgrade and difficult to synchronize across a company’s system network, especially if everyone has a different model of computer. Worst of all, hardware could sometimes fail to read on certain machines or require costly hardware upgrades. With outsourced IT, none of these problems occur because MSPs always equip the most high-tech computer arsenals. The MSP tests and updates software, then your team just logs on and benefits from the improved performance. For most SMBs, the tasks involved with the implementation and update of system programs can be time-consuming and confusing. With an MSP at your service, you can avoid these distractions and focus on business as usual. Offsite IT services specialize in the implementation of computing and mobile networks and the integration of software programs. Managed service providers handle these sorts of tasks on a daily basis and can implement programs in just a fraction of the time it would take to achieve in-house. When issues do arise on-site, an outsourced IT service will walk your staff through the trouble at hand. Whether the issue involves confusion over a system update or problems with network synchronization, your team will have access to support from IT experts who know how to solve each and every computing issue that could arise. Most of today’s larger companies have moved their files onto cloud storage for guaranteed backup regardless of local hard drive or server failure. Due to the convenience of cloud storage, many SMBs are now following suit. With everything backed up on a cloud, all of your digital files will exist for as long as you need them. By outsourcing your company’s IT tasks, you can cut down on operating costs and allocate time and resources to more productive matters in-house. Companies outsource IT to have vital computing tasks performed by the most skilled, qualified hands. IT personnel command high pay due to the intricacy and rarity of their skill set. For SMBs, the costs of retaining an IT staff can be prohibitive. With outsourced IT, your company can avoid the costs of retaining an in-house IT staff and allocate more money toward expanding the business.Companies that handle IT in-house are often saddled financially and time-wise by the tasks involved with computing. All that time and money spent on research and implementation in the computing area could instead be reserved for the core strengths of your company. Then, in turn, you can pass these savings to your customers in the form of lower-priced products and memberships. Likewise, the amount of money that could be swallowed up in unforeseen computing problems is a troubling concern. Once you decide to outsource your company’s IT to an MSP, you’ll always know what you will be paying month-to-month for maximum IT functionality and security. If your computing system is small and simple, you can pay for the minimal necessities of IT and scale up as your system arsenal grows in proportion to your business. You can scale back and pay for what you need depending on seasonal trends and how they impact your computing needs. Despite their wide-ranging skills, most IT staffers do have their limitations. Occasionally, an issue is liable to arise that could leave a given IT tech pro confounded. When you outsource your IT, your in-house computing maintenance needs are not restricted to the skills of whoever you may have on staff. With an MSP, your computing needs are covered on all fronts. The time it takes to train IT applicants on the details of your company’s computing infrastructure can drain your business of resources you could use in other areas. This can be especially draining if IT staff come and go, and the skills of those who do apply run the gamut. With an MSP, you don’t have to reserve time for in-house training or worry about changeovers in personnel and quality among an IT staff. For most SMBs, IT issues are a secondary or tertiary area of knowledge. Unless your business is directly involved in the IT industry, how can you really gauge the skill-level of an IT applicant, let alone train that individual on the ins and outs of your in-house computing system? When you outsource IT tasks to an MSP, you never have to be distracted by these confusing questions.Some of the world’s largest corporations keep their IT departments in-house simply because they have the money to hire the best talent in the field. The majority of SMBs, on the other hand, lack the resources to hire top-level IT talent. With IT outsourcing, the playing field is leveled because MSPs are staffed with the caliber of talent demanded by big companies. Best of all, MSPs offer top-of-the-line expertise at rates affordable to SMBs. In the world of computing, new issues and challenges emerge every day. An isolated IT employee who has spent years in the same office will typically have a knowledge-span limited to the problems known to that company. By contrast, the staff at an MSP will be experienced in a much wider range of computing issues, having serviced companies across the private and government sectors. MSPs take IT extremely seriously and are on-the-ball nonstop regarding all matters pertaining to the field. When you outsource to an MSP, your company receives IT service with utmost discipline. When IT responsibilities are outsourced to an MSP, your in-house staff can focus on the more pressing day-to-day concerns of business. Even if you have local IT personnel, an MSP can handle the heavy lifting and allow your computing staff to focus on more immediate concerns, free of maintenance troubles. In-house productivity becomes far more efficient and streamlined. With an MSP at your service, your team can focus on their core strengths and leave IT tasks to qualified, off-site personnel whose own core strengths cover the full range of IT-related issues. Whenever your company needs to have a program implemented, an MSB can perform the task instantly and have the whole thing up and running with network-wide compatibility. If you keep these tasks in-house, the steps that involve program implementation and network adaptability could leave your operations in limbo for weeks on end. With outsourced IT, you don’t have to pause your regular operations waiting for implementations. An MSP works behind the scenes from an external location to service you on an ongoing basis. As this is happening, your business could regularly witness improved customer satisfaction thanks to the virtual elimination of service interruptions and downtime. With outsourced IT, your company will rarely, if ever, be beset with problems such as downed customer-support lines and unresponsive online sales portals. When you have an MSP working behind the scenes on your side, you virtually eliminate the possibility of downtime or cyber attacks. The problems that could set a company back and damage its reputation, such as long periods of website inoperability or breaches of credit card information, are taken off the table when you outsource IT to third-party specialists.Some of the more troubling aspects of computing technology involve compliance issues and changing laws and regulations at the national and international levels. Part of the job for an MSP is to keep on top of these developments to ensure that you are always in compliance. Potential Downtime: Your company may experience downtime if there are no technicians available to resolve your issues immediately. However, you can avoid this pitfall by choosing an established provider that has sufficient personnel. Security Issues: When you outsource IT, you trust them to keep your company secure — but you might not know what security protocols they have in place. You risk using inferior protocols, especially with an offshore MSP that might not be well-versed in your country’s regulations. Misaligned Objectives: The right IT provider works with you to help you reach your business goals. The wrong provider might insist on systems and processes that actually reduce functionality and hinder your business. Limited Flexibility: The wrong provider may also require you to use proprietary software. If that’s the case, you might feel stuck with them, especially if they haven’t documented their work on your network.Of course, you can avoid these risks by selecting a quality managed IT provider and asking the right questions. When to Outsource Your IT? Now that you know why you might want to outsource your company’s IT, you make be wondering how you know when it’s the right time to make the switch. If your company has had cost concerns and downtime due to hardware and software issues, now is the time to outsource your IT. If your company is too small to open an IT department or you just wish to save money and forgo an IT staff, an MSP is a perfect solution. With outsourced IT, the tasks that the in-house department would handle in exchange for high salaries can instead be handled externally on a monthly subscription basis. Best of all, the service is superior to what you’d typically find among a string of IT applicants. Outsourced IT solutions can benefit your company even if you do have an in-house IT department. An MSP exists to handle IT functions on an ongoing basis day in, day out. While your in-house team focuses on computer operation, the outsourced IT service will handle all the tasks involving software updates, security patches, security warnings, file protection and regulatory compliance. With outsourced IT to manage the never-ending concerns of network computing, your in-house staff is free to zero in on the skills that are most applicable to your company. Computing aside, some of the most significant benefits of outsourcing IT services fall into the financial category. With outsourced IT, you can allocate in-house resources to tackle better the daily needs of your company. The services of an MSP cost less on a monthly basis than the salaries commanded by most in-house IT staffers. This is because MSPs handle nothing but IT for a vast range of clients large and small, whereas an in-house IT staffer would rely solely on you for his or her income. Outsourced IT services use only the most high-grade technologies on the market today. Whereas you might pay a fortune to have top-of-the-line hardware and software arsenals set up in your company offices, the same technology can be accessed offsite at a reasonable monthly rate. Best of all, your in-house staff does not even need to learn the more complicated aspects of hardware operation and software installation because the MSP handles all such tasks. Outsource Your IT to Consolidated Technologies, Inc.
At Consolidated Technologies, we offer B2B solutions for IT, security, networking and voice/data/video solutions. We complete each job to 110% and manage your IT functions so you can focus on other areas of business. Contact us today to learn more about our services.